I haven’t been cooking much, but what little I’ve done has prepared our house for the winter ahead. I think it helps that I live in a micro-climate that seems to be warmer than other, more open properties. My tomato plants were still green as could be before I pulled them out yesterday, for example, and I ate my last raspberry yesterday, too. I’ll probably still pick some bedraggled basil this week. So it’s kind of weird to be making apple butter at the same time I’m still pickling and freezing summer. But I am. I made ajvar out of my own peppers and those I got from others, roasting about 10 lbs. of ripe, red ones with a couple of smallish Italian eggplants. After removing the skins, I blended everything together with some olive oil and salt, and froze it in small containers. It makes a great thickener for soups and layers well with bread or pasta. The other peppers, mainly Hungarian ones from Jeff Eaton but also some Ethiopian berebere that I grew on my own and some random jalapeños left over from making pepper vinegar — were dried for several days in the dehydrator. I was aiming for flavor over speed. One batch (above) I roasted on the grill before drying to make smoked paprika. Not as good as the Spanish stuff, but not bad. Then there’s my discovery of the year, the one product I’m not sure I can live without. They are so unbelievably delicious, much better than pickled peppers in vinegar. The recipe (from Linda Ziedrich‘s Joy of Pickling) is very easy. Just fill a 3L or so jar with halved pieces of jalapeño and other hot peppers, add a brine made from 2-1/2 tablespoons of pickling salt to each quart of water, and add a weight to the top so the peppers stay submerged. Leave on the counter for about 2-3 weeks, skimming off scum occasionally and making sure the peppers are below the liquid, then refrigerate when they are as sour as you like them. The peppers in brine won’t bubble as much as dill pickles do, but you should see some bubbles on the surface after 2-3 days. Instead of being bleached and exhausted by the vinegar, the flavor of the peppers is enhanced and deepened. 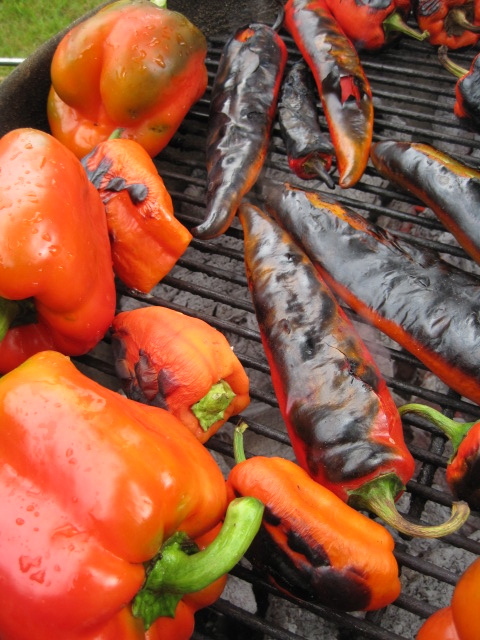 I have been using the peppers in everything this fall — my salsas, stir-fries, pasta, eggs, greens, beans, meat marinades. Already went through a half-gallon, so I put up two more large jars with the hopes that they’ll last me through the winter. The sour, slightly salty, spicy brine that’s left behind is delicious and full-flavored, wonderful splashed in vegetables or used to deglaze a pan. The only thing to remember: store it in the refrigerator, or the particles in the brine will continue to ferment and create more scum growth on the top of the jar. Jennifer: Do the peppers need to be refrigerated also after they sit on the counter for three weeks or so? Please tell, tell. Yes! Or else they’ll keep fermenting. I’ll add a note. 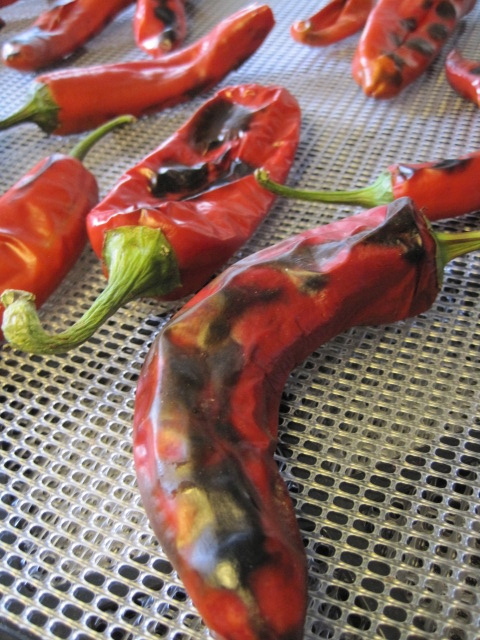 For the fermented peppers, do you roast the pepper first and remove their skins? I ran home after the Fun With Fermenting talk you gave and started fermenting some of those amazing jalapenos. That white stuff is on the peppers which is underneath the brine. Will they still be good? I figure if they smell bad they are bad but I want them to keep going as I’m still hopeful! Hi Penny, sorry about the delay in my response! Hope you didn’t throw them away. White underneath the brine is perfectly fine, as long as it smells nice and peppery and good. It’s just yeast. I had quite a bit on mine this year. It will eventually settle to the bottom. Just make sure that the peppers stay submerged at all times. Thanks Eugenia!! I did not throw them away and have in fact been eating them! They taste really good. I’ve been rinsing them off due to being a little salty.